The book of the young writer Bernard Jan, Look for me under the Rainbow is thematically bound to the ecological aspect of the survival of our planet. The peril of vegetable and animal species, even man himself, through his own immense possibilities of changing nature and destructive activities, becomes the key problem of our everyday life and our future. Therefore such a wording, choosing the extirpation of an animal species - the subjects are seals - for its theme, is utterly welcome, helping with its strength and affective telling, as a little contribution to the efforts for the SOS for Earth, to stir up the "human feeling" buried deep within us, as the author himself says. 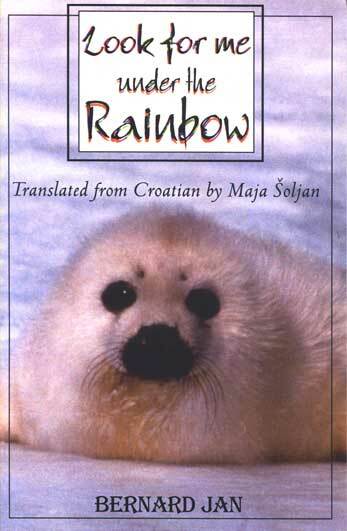 It is a tale about seals, a seal family to be precise, which lives somewhere in the north of Canada and it seems that they have all the possibilities to follow the natural rhythm of being born, growing up, migrations, biological selection and at last the vanishing of an individual. The young seal, Danny, should carry on his way all the experience of his kind, being able to continue it. But man got in his way, the good and the bad one. At this moment the generous efforts of a too small number of people (Greenpeace), seem not to be sufficient. Man needs the pelt of the seals and he takes it in the cruelest way. Coming back into our everyday life, we have to stop for a moment, after reading this story, and ask ourselves: "Is this really possible?" Although we now that it is true as we are all witnesses to a huge negligence in protecting our environment. Danny finds his sad end in a trawl net, which lost its purpose and was thrown away by fishermen to float aimlessly and to destroy the undersea world. The value of this book is defined not only by the outstanding message it carries, but also through the artistic power of the young writer, who translates into reality the fine line between prose and poetical narration. With many poetic details and a deep engagement into the mechanisms of thinking and behavior of his characters, he realizes the atmosphere which will remain deep inside of us for long after we close the jackets of this book. Bernard Jan is the pseudonym of this young author, who lives and works in Zagreb. The book is provided with photographs granted by the Greenpeace Foundation. The text has been reviewed and recommended by Mrs. Hrvojka Mihanovic-Salopek.